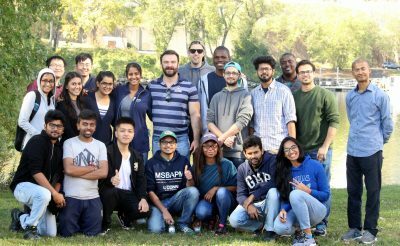 On October 13th, 20 17, UConn’s Graduate Net Impact Chapter hosted a volunteer day for Riverfront Recapture, a non-profit organization that manages downtown Hartford’s riverfront park system. An enthusiastic group of 21 UConn graduate business students got their hands dirty working to maintain the riverfront parks, leveling and grading several paths in preparation for the Hartford Marathon the following day. While bringing UConn business students together to help their local community was one goal of the event, it was also an opportunity for volunteers to learn about the importance of the Connecticut River to the vitality and economic development of Hartford. Established at the confluence of the Connecticut and Park Rivers in 1637, Hartford has a long and complicated relationship with its rivers. In the 1930’s, major flooding issues led to channelization of these rivers and the construction of a levee system. In the following decades, an interstate highway was built on top of these riverfront levees, effectively cutting off downtown Hartford from the Connecticut River. Pointing to a series of floodwalls on either side of the Connecticut River, Chris Hayes, Director of Operations at Riverfront Recapture, explained how Hartford’s aging levee system is now in need of major reconstruction. Without significant improvements, downtown Hartford is at risk of major flooding. Property owners may soon be forced to purchase flood insurance. Since the 1980’s, Riverfront Recapture has led the effort to improve the quality of life in Hartford by recapturing its riverfront property for the economic development of the city and the enjoyment of the public. The non-profit organization manages Hartford’s four riverfront parks, and has continuously expanded the footprint and accessibility of the parks while offering cultural events and recreational activities. To find out more about Riverfront Recapture and get involved, visit www.riverfront.org. This entry was tagged Business Students, Net Impact, Riverfront Recapture, UConn, Volunteer.